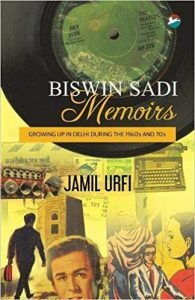 Jamil Urfi’s book of memoirs Biswin Sadi is a feast for all those who were coming of age in the 60s and 70s. Even though it is based in North India, anyone anywhere belonging to that generation is sure to exult and relive memories of Binaca Geet Mala, Chitrahaar, Bhoole Bisre Geet and the aggravating Krishi Darshan. Since I too stake a claim to the Indianized beat generation of that time, for me the book is a brave attempt to capture moments in the cultural history of a time which seems to fade out in the face of the digital technology of today. The book takes its name from a popular Urdu magazine of the seventies and is a memoir of sorts, personal as well as cultural. The chapter divisions are poetic and present surreal scraps of journeys through realms of lost time of old worlds, filmi times and Binaca Geet Mala days etc. The author calls up memories of his childhood and growing years in two cities of India namely Aligarh and New Delhi. It is about growing up in the sixties and seventies along with a post-Partition nation that was in the throes of change and reconstruction. The stay of the children with their grand-parents in Aligarh occupies only a small portion of the memoirs as they eventually moved to Delhi in the seventies into a post-Partition world which was rapidly rebuilding itself. The greater part of the book deals with the family’s life in Nizamuddin and their living in communal harmony in its rich cocoon of neighbours and friends who were publishers, businessmen and venerable old folk who had witnessed the horrors of Partition. The author has very commendably traced the geography and history of all the places that they lived in, be it Delhi or Pilibhit. He has given a very interesting account of DPS Mathura Road where he studied. His riveting accounts of travelling and trekking around Pilibhit, his ancestral town, and his descriptions of various people that he met there, have been rendered with sharpness and humour. In the chapter titled ‘Vestiges of the Old World’ he dwells on some flashbacks of Muslim life back in Aligarh untrammelled and unchanged and even carried over to Delhi. Our house therefore had a paan daan with all the necessary ingredients for preparing the katha, like chuna, etc., and a large stock of paan leaves kept in a moist cloth. For cutting betel nuts into small pieces, an instrument known as sarota was also there. Urdu language too occupied a place of eminence and dignity in Muslim households and the author makes mention of how his elders encouraged him to read more Urdu. He mentions the popularity of Jasoosi Duniya and the works of Ibne Safi. His intrusive delving into lives and characters of people he came across in his childhood holds enough material for a Malgudi Days like book. The episode about Anwar Tami (a derivation of Tommy) and their failed hunting trip is a well written nostalgic. The book can be read at various levels though apparently the narrator goes back and forth to his growing up years in the seventies. The sum total of his existence in those years is however not limited to his family life, rather he grows outward to comment on the social and cultural world of the seventies. This includes facets and glimpses in the form of personal events, friendships, movies, music and political realities. The account of Eid celebrations with Hakim Abdul Hameed the man behind Hamdard Dawakhana Trust, is fascinating to read. He does not forget to mention the mass attraction to television when it first appeared in Delhi and how they would gather at a neighbour’s house to watch those early programmes which would time and again end with ‘rukawat ke liye khed hai’ which according to him has become an idiom. Above all, it is a touching memoir and a record of the life of a young Muslim boy who struggles to discover his true identity in the seventies. There is a rare honesty in the way he deals with all the challenges of growing up and in his attempting to answer some perplexing questions about the place of Muslims in erstwhile society. His accounts of his teenage years about his being consistently pushed to opt for a career for which he was unsuitable is relevant to the lives of teenagers today too. His philosophical attitude to his father’s bitterness at not being able to be absorbed in the AMU faculty and their consequent move to the greener pastures of Delhi which according to him happened for the best, reveals an inspiring re-evaluation of life as he saw it at the close of the twentieth century. All in all the book is an endearing tribute to a beautiful world of the Biswin Sadi and is a treat to read and browse through. Sami Rafiq is Professor, Department of English, Faculty of Arts, Aligarh Muslim University, Aligarh.